For years, the story has circulated that Giovanni Montini ("Pope" Paul VI) is alleged to have remarked that "the smoke of Satan" had entered the Vatican, and he was upset/remorseful about it. "Satanic smoke" had come in through the "open windows" of Vatican II--that "fresh air" Roncalli ("Pope" John XXIII) wanted everyone to breathe in. The satanical smoke was made worse when Montini tossed all the dogmas of the Church into the flames of Hell, to make room for his demonic Vatican II sect. People are now bringing back the old "smoke of Satan" story in an attempt to explain the "papacy" of Francis. The Society of St. Pius X (SSPX) and other "recognize and resisters" (R&R) want to shift the blame off of Bergoglio and the false popes of Vatican II and onto a "diabolical force" that is putting the Church through some sort of "passion" akin to Our Lord. Truth be told, satanic influence is not within the Modernist Vatican; the false popes actually worship Satan--- and Lucifer himself runs the show. If you think I'm being hyperbolic or relying on some conspiracy theory taken from the pages of a Malachi Martin novel, such is not the case. According to the heretical Vatican II ecclesiology, the "Church of Christ" is not the same as the Roman Catholic Church. This entity (Church of Christ) is partially or fully present in a religion according to how many "elements" each religion has; to have all the elements like the Catholic Church is best, but to have just some elements is good too and leads to Heaven. Hence, in the Vatican II document Nostra Aetate, we read in paragraph #2: Thus in Hinduism, men contemplate the divine mystery and express it through an inexhaustible abundance of myths and through searching philosophical inquiry. They seek freedom from the anguish of our human condition either through ascetical practices or profound meditation or a flight to God with love and trust. Again, Buddhism, in its various forms, realizes the radical insufficiency of this changeable world; it teaches a way by which men, in a devout and confident spirit, may be able either to acquire the state of perfect liberation, or attain, by their own efforts or through higher help, supreme illumination. Likewise, other religions found everywhere try to counter the restlessness of the human heart, each in its own manner, by proposing "ways," comprising teachings, rules of life, and sacred rites. The Catholic Church rejects nothing that is true and holy in these religions. She regards with sincere reverence those ways of conduct and of life, those precepts and teachings which, though differing in many aspects from the ones she holds and sets forth, nonetheless often reflect a ray of that Truth which enlightens all men. (Emphasis mine). Pagans (Hindus and Buddhists) are therefore commendable because they have some elements of good. What does the Church say about pagan "gods"? In Psalm 96:5, we read: " For all the gods of the Gentiles are devils: but the Lord made the heavens." Again in 1 Corinthians 10:20: "But the things which the heathens sacrifice, they sacrifice to devils, and not to God. And I would not that you should be made partakers with devils." According to theologian Prummer, in regard to pagans and heretics, "Active and formal religious co-operation is always forbidden. (Canon 1258, section 1)." On February 6, 1986, in the city of Chennai, India, "St." John Paul II, actively participated in a Zoarastrian ceremony by lighting a candle while wearing a stole with the symbols of the pagan religion. This was the religion of Babylon during Hebrew captivity. When 25 Jewish priests adored the sun inside the Temple, God considered it an abomination and severely punished the Hebrews for their participation in pagan worship. (See Ez. 8:16). Ratzinger celebrated the 20th anniversary of the 1986 "Intereligious Meeting of Prayer for Peace." He held yet another such abomination on October 27, 2011 (25th anniversary of the original) wherein a Voodoo witch, Wande Abimbola, sang a hymn to the (demon) goddess Olokun at the Assisi Basilica of Holy Mary of the Angels. The import is clear: a good thing (world peace) can be effectuated by something intrinsically evil (pagan worship of demons). Can you imagine Sts. Peter and Paul inviting the pagan Romans to pray to Jupiter for world peace rather than condemning them? No? How about St. Leo the Great inviting Attila and the Huns to pray in Rome for peace instead of ordering them out of the City? Can you imagine St. Francis of Assisi praying with Mohammedans instead of telling them to accept Christ and convert? The defenders of Vatican II will try to think that paganism is not all evil, and does not involve Satan. This is a lie. TV shows and movies such as Bewitched, Sabrina the Teenage Witch, The Craft, Practical Magic, and Charmed all seek to portray witchcraft ("Wicca") as benevolent, or at least having a benevolent side. Disney' film The Little Mermaid also portrays a witch. Although that witch is not good, it shows someone making a pact with a witch and getting out of it on her own wits. You cannot bargain with the devil. According to the U.S. Chaplin's Manual, The Church of Satan was asked about proselytizing. Their official response, published in the 1994 edition, reads: "The church does not proselytize, but welcomes inquiries from honest potential Satanists who hear about the church from various books about it, the mass media, or word-of-mouth." How did the American Council of Witches respond to the same question? "Witches do not proselytize, but welcome inquiries from those who hear about the craft by either word-of-mouth or the media." The Wizard of Oz (1939) was based on a book of the same name written by Frank Baum, an occultist who claimed he had "channeled" the idea from an other-worldly source. (See Michael Patrick Hearn edition; The Annotated Wizard of Oz, New York: Clarkson N. Potter, 1973) In the movie, the protagonist (Dorothy) and her friends are following the "yellow brick road." In Heaven, it is said there are "streets of gold" (See Apoc. 21). They go to see the "all knowing, all powerful" Wizard of Oz. Only God is omniscient and omnipotent. It turns out the Wizard is just a fake. (Wiccans denigrate or even deny the Christian God). Lastly, they are told that the power to obtain all they want (courage, brains, a heart, and going home) "lies within"--a common theme in witchcraft and Satanism; independence from God. Paul VI was behind the "smoke of Satan" and it was helped along by his false pope successors. John Paul II directly worshiped with pagans and was "canonized" a "saint" by Francis. Vatican II tries to see "good" in evil as part of its heretical ecclesiology. The media also wants to push this same idea on us. Thankfully, the True Church teaching is clear. 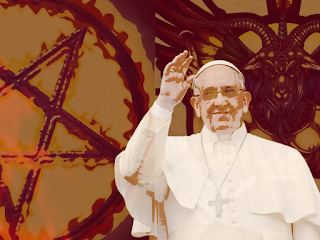 The problem is not satanic smoke, it's the doctrine of demons coming from a smiling Bergoglio. Great article,down with the false church,with false Sacraments,with a false mass,a false holy week,a false Holy Saturday,and a non existent holy communion fast.Keep up the Holy writings Introibo!! By the Grace of God I will my friend! Thank you for the kind words. Fr.Ratzinger also had an agnostic feminist speak at Assisi 3. Unfortunately, I'm not at all surprised! Minutes before reading this article I had mentioned to my wife that what Pope Francis did for the 6th Commandment, John Paul II had already done for the 1st. Even setting all theological and ecclesiological concerns aside, I would still object to a loathsome document like Nostra Aetate solely in my capacity as a philosopher and historian. Whoever penned those paragraphs clearly knows nothing whatsoever about Hinduism or Buddhism, has never penetrated into the depths of those religious systems and the worldviews they express, and is basically projecting into theme fabricated, superficial notions which their own chief adherents would emphatically deny. This, I believe and have always believed, is the crack in the False Church's edifice that can be most profitably exploited to bring the whole wretched establishment crashing down. Just consider the following for a moment. If you were a student at a reputable European university ca.1950, and if you had been asked to write a post-graduate thesis on comparative religions and you came up with Nostra Aetate, you would have been flunked. Why? Because anyone who actually understands the subject can see that the ideas presented therein are manifest nonsense (and again, I am speaking merely as a secular scholar here, not as a Catholic theologian). If a student had handed me Nostra Aetate as an example of his historical and philosophical scholarship, I would have concluded that he was mountebank, a halfwit, and a slacker who was trying to fake it. So the question now becomes, why is it that when the same bilge is promulgated by the Second Vatican Council, it is greeted with virtually no intellectual objection of the secular sort? Where are the scholars to speak up and say, "I'm sorry Your Excellencies, but your understanding of Hinduism and Buddhism (and apparently of Catholicism as well) is really just preposterous"? The answer is a complex one, but a lot of it boils down to this. We live in a solipsistic era that cannot handle much truth. The elites and the intellectual trend-setters of the Western World want to believe in the universality of their stock of bald-faced platitudes and are willing to blink away any facts to the contrary. They will not accept the fact that cultures, peoples, religions differ substantially in what they hold to be important, let alone undertake the hard intellectual work of describing, categorizing, and evaluating such distinctions. In doing so they have shirked their duty to truth; they have shut their eyes to reality. There can be no salvation for those who are willfully blind. Had we lived in an age more receptive to truth, the whole Vatican II revolution could have been thwarted by a small cadre of genuine intellectuals. No doubt there were such people and they did write their criticisms, but in the actual case nobody paid any attention. They wanted to believe otherwise. They did not even rise to the level of embracing clear heretical ideas; instead they embraced a childish unicorn fantasy which merely entailed the heresy. Whether any of this was really, metaphysically true or not didn't even enter into the matter. He stated: "...Another central aspect (of the fundamental theme of ecclesiology which they determined was so important for the Council), especially for the German episcopate, was ecumenism: the shared experience of Nazi persecution had brought Protestant and Catholic Christians closer together; this now had to happen at the level of the whole Church, and to be developed further." Further on, he states: "I am referring to the Declaration "Nostra Aetate"...At the outset the intention was to draft a declaration on relations between the Church and Judaism, a text that had become intrinsically necessary after the horrors of the Shoah. The Council Fathers from Arab countries were not opposed to such a text, but they explained that if there were an intention to speak of Judaism, then there should also be some words on Islam. " Since the primary focus of Vatican II was "ecumenism", and the Jews were so important, with a particular demand from the Council Fathers from Arab countries, then it stands to reason they would also have to expand their "respect" for every other religion, particularly the other "major" religions such as Buddhism and Hinduism. But clearly, if one is familiar with who the German and French Fathers were, they would know they were the heretics and apostates who have spread their evil garbage (including Ratzinger) for decades. Vatican Two-ism is a religion by and for clownish Western fantasists, for stupid children and their perverted politicking hierophants. It is not for sane and sober adults; it is not for men. Any sort of sound and determined manly love of the real, be it in regards to either thoughts or actions, would show up the Vatican II Church for the illusion that it is. Manliness is the antidote to VII-ism, and it is for that very reason that all of the False Church's counsels and proscriptions are locked in arms against it. Always a pleasure to read your comments, Matt! You make quite a contribution to this post. As the true Gospel has been preached throughout the world, now we are experiencing the false (counterfeit) gospel being preached and exercised throughout the world. They are seemingly preparing the way for their false Christ. Those who have eyes I see and ears to hear, you must familiarise yourselves with Holy Scripture lest you be seduced. We are living through the great apostasy, the great falling away, the operation of error as mentioned by St Paul. This is a "sorting out the wheat from the chaff" period in human history. Detailed self assessment is required - ask yourselves and answer honestly " do I truly know what Holy Mother Church teaches?" If not, get learning because the infection of false doctrines has already taken hold and you are "not in a good situation." We must remember, we are with God or we are against Him; there is no in between. Excellent comment & advice,thank you. The SSPX types are too busy defending "pope" Francis and the SSPX to be bothered with learning,living,and accepting the true Roman Catholic Faith. My name is Georgianne. I spent a few hours reading your blog tonight. It makes sense, and yet I'm afraid/hesitant. I attend a FSSP church. Looks like I ought to go to a nearby SSPV in the morning instead, right? I'm trembling. Pray for me, my husband, and children, please? Thank you. You're in my prayers Georgianne. I ask all my readers to pray for your family and you that you have the Grace to leave the FSSP for SSPV. Not only is the FSSP in Union with the false "pope," their priests are invalidly ordained by "bishops" consecrated in the invalid rite of Montini (Paul 6). Hence, they are not valid priests and their "mass" gives you nothing but ordinary bread. God bless and keep your family and you! It's Georgianne, again. My husband agreed, and we went to the SSPV this morning. The Collect made my eyes just about bug out! Anyway, I have some questions that I'm sure are so basic and elementary, but I'd appreciate someone with maybe 10- 15 minutes of patience for that? I will call Father tomorrow, also and see if he'd like to help this newbie. I went to St Anne's in White Bear Lake, MN. Are you familiar with that church and priest? Thank you, dearly, for your prayers. I'm amazed that I came across your blog last night. It was a very, very quick answer to a prayer from Our Lady. May God bless and keep you, also. Thank you, again. mteske12@comcast.net is my email if you or any of your friends would like to help me understand just a few things. I will pray for you & your family's moral and spiritual well being,Georgianne. I haven't ever met him but his website is good and he will answer your questions via email. His sermons are sound and catholic plus their magazine,The Seraph,is full of information vital for Catholics. Paul VI extolled the greatness of the old Mass in his very act of replacing it with the new. Likewise, he fostered the revolution at Vatican II, signed all its documents into Church law, and then claimed that the smoke of Satan had entered the Church. I do not understand why Traditional Catholics repeat this phrase of his when they know full well that Paul VI was a major player in bringing the smoke of Satan into the Catholic Church thus turning it into a new and satanic counterfeit of the old.